IRCU is traditionally considered as lifestyle disease (associations with, among others, overweight, obesity, hypertension, type-2 diabetes), arising from excess, in 24 h urine, of calcium (Ca) salts (calcium oxalate (CaOx), calcium phosphate (CaPi)), supersaturation of, and crystallization in, tubular fluid and urine, causing crystal-induced epithelial cell damage, proteinuria, crystal aggregation and uroliths. Another picture emerges from the present uncontrolled study of 154 male adult IRCU patients (75 stone-bearing (SB) and 79 age-matched stone-free (SF)), in whom stone-forming and other parameters in fasting urine and plasma were contrasted with five biomarkers (see footnote) of oxidative metabolism (OM), without and with variation of markers. In IRCU a) numerous constituents of fasting urine, plasma, blood and blood pressure change in response to variation of OM biomarkers, suggesting involvement of OM imbalance as factor in functional deterioration of tissue; b) in the majority of patients a positive exponential relationship links urine Ca/Pi to urine Ca/Pi divided by plasma Ca/Pi, presumably to accumulate Ca outside tubular lumen, thereby minimizing intratubular and urinary Ca salt crystallization; c) alteration of interactions of low urine nitrate, PTH and Ca/Pi in plasma may be of importance in formation of new Ca stone and co-regulation of dynamics of blood vasculature; d) overweight, combined with OM-modified renal interstitial environment appears to facilitate these processes, carrying the risk that CaPi mineral develops within or/and close to blood vessel tissue, and spreads towards urothelium. For future research focussing on IRCU pathogenesis studies are recommended on the role of affluent lifestyle mediated renal ischemia, mild hypertensive nephropathy, rise of uric acid precursor oxypurines and uricemia, clarifying also why loss of significance of interrelationships of OM biomarkers with traditional Ca stone risk factors is characteristic for SB patients. The pathophysiology of IRCU is multifactorial, including both influences of environment and intrinsic metabolism ; details are insufficiently understood and a unifying concept is not in sight. In work published until present two opposing theories compete: One, worked out between 1960 - 1980 [see ref. , is based on physico-chemistry, ascribing formation of calcium (Ca) stones to supersaturation (SS) of tubular fluid and urine with more or less soluble salts and substances such as Ca oxalate (CaOx), Ca and inorganic phosphate (CaPi), uric acid (UA), followed by crystallization, crystal adhesion to and incorporation by tubular epithelial cells, with microlith formation being a secondary step [2, 3]. Another theory, formulated earlier and at that time neglecting urinary supersaturation and crystallization as primary events , favors stone formation as process starting from renal interstitial areas (so-called plaques) [4, 5] which, from yet unknown reasons, are characterized by hydroxyapatite (HAP) content . This crystallized Ca-rich mineral forms preferentially in plaques of stone forming males  from excess of Ca over Pi (Ca/Pi) , i.e., independent of fluid volume (interstitial fluid, urine) and urinary SS(U-SS)-HAP. Also, generation of HAP-containing plaques from amorphous CaPi requires an alkaline environment , as prevails in renal interstitial tissue. Plaques were described as located in close vicinity to basolateral membranes of tubular epithelium and blood vessels (vasa recta) [4, 6, 9], and high blood pressure (BP) was found to be the only clinical parameter correlating with plaques . Thus, investigators of IRCU pathogenesis are forced to consider one or more systemic factors the presence of which may or may not lead to clinically detectable stone as endpoint, independent of a urinary crystal- and stone-initiating role of urinary SS. To approach a solution, better knowledge of the metabolic environment of Ca stonc-bcaring (SB) vis-á-vis stone-free (SF) patients appears indispensable, a goal to achieve by a much broader laboratory program  than hitherto practiced in clinical stone centers. More specifically, information is required not only on the state of renal glomerular and tubular function, urine Ca, Pi, Ca/Pi, SS-HAP, SS-CaOx and proteins, but also on minerals and proteins in systemic plasma, blood acid-base data, BP, body mass index (BMI) and age, thoughts insufficiently pursued by us in earlier work [10, 11]. From database of anatyzed biosamples of our IRCU patients a preliminary impression was that SB and SF patients differ in several regards: In SB, but not SF patients high HAP supersaturation of fasting urine was found associated with higher urine pH and higher blood bicarbonate (HC03 _); when HAP supersaturation was low, the urinary molar Ca/Pi ratio was low too, and vice versa; conversely, in SF patients lower plasma uric acid (UA) was found associated with renaltubular loss of UA, and uricemia appeared to vary inversely with U-SS-HAP, directly with BP. Knowledge on the role(s) played by UA, especially as biomarker of oxidative metabolism (OM), i.e., as factor in the maintenance of oxidant/antioxidant balance is incomplete in a number of diseases [12, 13]; on the other hand, damage of vascular tissue and modulation of BP arc sequelae of overproduction of reactive oxygen species (ROS) and/or deficient ROS scavenging, or both [14, 15]. From such observations we reasoned that malregulation of OM could be a systemic factor capable of paving the way for development of a metabolic environment, in turn allowing that disordered Ca and Pi levels develop in blood and urine, with formation of new Ca stone, and eventually, a rise of BP as secondary events. To obtain better information, a platform of data is needed from which new testable hypotheses can be formulated. The following uncontrolled study is an extension of, and to some degree summarizing, our previous reports in this area [11, 16–20]. The focus was on several questions: 1) are the levels of bio markers (see below) different, depending on whether SF or SB patients are studied; if not, in which other regards arc these subsets of patients different; 2) are traditional Ca stone risk parameters subject to modulation by variation of bio markers; 3) which factors influence the frequency distribution of SF and SB patients; 4) study of interrelationships of variables and, if helpful in understanding events involved in formation of new Ca stone, to comment a possible initiating role of OM. The database of a total of 154 adult middle-aged male IRCU patients allowed to recruit a roughly equal number for SB and SF subsets. Details of the general criteria of participants, including the clinically assessed actiyity of Ca stone formation (ASFP) in the two years preceding the laboratory examination (see below) were earlier described [11, 16]. In brief: European residents of the North Bavarian region in Germany, experience of more than one stone episode in the past, IRCU diagnosis by KUB, stone analysis by X-ray diffractometry, petrographic microscopy and wet-chemical analysis, respectively, with stone analysis confirming that in approx. two thirds CaOx (as di- and mono-hydrate) was dominant over CaPi (as HAP or precursors), despite absence of CaOx crystals but abundance of noncrystallized (amorphous) CaPi (Ca/Pi ≤ 1.0) in fastingurine  as studied herein (see below). Additional requirements were absence of gastrointestinal surgeries, especially gut resections, urinary tract infection (bacillus proteus, others), hematuria (dipstick-positive urine), oxaluria (≥ 0.5 mM in 24 h urine), other systemic disorders (pHPT, RTA, diabetes mellitus, gout), cystitis and urethritis, with the latter two minimizing that post-renal proteinuria was caused by them. Finally, all patients negated anti-stone medication, vitamin and mineral supplementation of daily food during the past 6 weeks, and all were advised to omit intake of oxalate- and salt (sodium chloride)-rich food and to drink but tap water during the 12 - 15 h night period preceding the ambulatory laboratory examination (sec below). After the study goals were communicated, all agreed to investigations carried out according to the principles of the Declaration of Helsinki. All data reported herein were obtained from a standardized ambulatory examination, as outlined in detail elsewhere . The basis was the fasdng period  during which patients stayed in the laboratory (after at home collection of a 24 h urine that serves for exclusion of mild hyperoxaluria), measurement of blood pressure (twice in a recumbent position at the non-dominant forearm), stimulation of diuresis by drinking of 300 ml distilled water to achieve approx. 1 ml urine flow per min, puncture of an ear vein (for immediate blood gas analysis), withdrawal of venous blood without stasis from the pre-warmcd non-dominant forearm, and bladder voiding. Aliquots of plasma and paper-filtered urine from the exactly timed 2 h fasting period  were prepared, and either immediately analyzed or stored at -80°C. UA concentration in plasma; at present widely conceived as ROS scavenger [22, 23], there are arguments that it is not this mode alone through which plasma UA contributes to OM balance or imbalance [23, 24]: The cytoplasmic UA-synthesizing xanthine (XA) oxido-reductase (XOR) is renally expressed, but outside glomerula , releases ROS  and thereby diminishes the ROS scavenging capacity of UA; in addition, ab inido low uricemia, for example owing to defecj/ivc renal tubular UA reabsorption , can account for insufficient ROS scavenging by UA. Therefore, erroneous conclusions may be drawn from isolated consideration of plasma UA in vivo . Malonedialdehyde (MDA), a major product from ROS interactions with lipid and lipoprotein (peroxidation) containing cell membranes ; high MDA is considered to indicate deterioration of trans-membrane transport function for vitally important substances, Ca ions included . Nitrate (NTT), an oxidation product of the blood microvasculature dilating nitric oxide (NO) of endothelial origin ; urinary NIT is accepted as marker of total NO production [31, 32]. However, NO can act also as free radical [nitrativc stress; [33, 34] and high NO production can exert dual actions [34, 35]. The ratios MDA/UA and 5) NTT/UA were introduced as possible markers of oxidant/antioxidant imbalance, attempting to disentangle the above-mentioned intertwined in vivo situation (simultaneous presence of oxidants and antioxidants). The overlap of patients in present and previous work, following substantially different strategies [19, 20], was about 95%. The study was retrospective, observational, cross-sectional and correlative (healthy control individuals were not included). The ranges of ASFP, age and BMI (measured in laboratory), were kept roughly comparable in SB and SF. Results were presented in five sections, with considerable complementary and supportive data packages (from sections 3, 4, 5) being incorporated into APPENDIX (APP; I (Table 5), II (Table 6), III (Table 7)). Routine methods or well-established techniques were utilized for analyzing urine, plasma and blood. Most of these were previously reported [10, 11, 16, 20], including the 14 analytes entering the calculation (see below) of urinary supersaturation (U-SS), urinary total protein and albumin (colorimetry and immuno-nephelometry, respectrively). Exceptions were the use of high performance liquid chromatography for Ox in plasma ultrafiltrate , urinary MDA , NIT , hypoxanthine (HX) and XA (both reported as indicators of hypoxia and hypoxia-mediated cellular ATP depletion [39, 40], commercial kits for radioimmunoassays of plasma intact (amino acid sequence 1-84) parathyroid hormone (PTH), 1, 25-dihydroxyvitamin D3 (l,25(OH)2D) and arginine-vasopressin (AVP), the former two bought from Nichols Institute, Bad Nauheim, Germany, the latter from Diagnostics Systems Laboratories, Sinsheim, Germany. Plasma osmolarity was measured by freezing point depression (Osmometer, Knauer, Berlin, Germany). Calculations included plasma non-albumin protein (N-Alb-P; as difference between total protein and albumin), U-SS-IIAP and U-SS-CaOx (expression as free energy (DG), see ref. ), renal clearance of endogenous creatinine, fractional excretion (FF) of minerals and other substances. Tn numerous instances log10 transformation of numerical values led to symmetric distribution, allowing application of Student's t-test. Categorical data were compared by Chi-square and the more sensitive Fisher's exact test. For practical purposes mean values (SE) are given, exceptionally mean and range. The level of significance of differences was taken as p < 0.05. From large matrices (simple correlations), constructed for unclassified IRCU (SF + SB) and separately for SF and SB subsets, interrelations and determinants (multivariate logistic (forward and backward) regression analysis; MRA) were identified using the software STATISTICA (Statsoft, Tulsa, OK; USA). In SB and SF patients the mean values of the five markers, age and BMI were statistically indistinguishable, and so was the mean higher ASFP in SB subset. BMI of the 154 patients was as follows: overweight (B.M1 ≥ 25.0 - 30.0 kg/(m)2) was the dominant segment (SB n = 51, SF n = 42), normal-weight (BMI < 25.0 kg/(m)2; SB n = 19, SF n = 32), obesity (BMI > 30.0 kg/(m)2, SB n = 5, SF n = 5), together contrasting with reports on obesity as a major risk factor of renal stone formation [42, 43]. Despite statistically indistinguishable OM biomarkers (Table 1), SB and SF subsets differ significantly in several regards (Figure 1; upper row): increase of urinary pH, concentration of total protein and N-Alb-P, decrease of FE-UA and B-HC03 _; only insignificantly different were (Figure 1, lower row) U-sodium (Na), U-volume, U-SS-FJAP, U-SS-CaOx, U-SS-UA, summed excretion of UA precursor oxypurines, and so was plasma AVP (mean values 5.1 (SB) and 4.5 (SF) pg · ml-1, respectively). For other abbreviations and further informations see footnotes and text. *: in codes A - E the limits of normalcy in 10 healthy male vokinleers of the authors' laboratory are: < 420 (A); < l 10 (B); < 375 (C); < 314 (D); < 1170 (E). Major characteristics of SB- (hatched bars) vs. SF- (light bars) patients. U: fasting urine; B: fasting blood; FE: renal fractional excretion (conceived as indicator of the capacity of tubules to lose or reclaim UA); for other abbreviations see below and text. Note that negative DG (I IAP, CaOx) by definition mean urine undersaturation (synonymous solubility, i.e. no solid formation and dissolution of preformed solid (41)). +: sum of urinary UA precursor oxypurine (HX: hypoxanthinc; XA: xanthine) excretion rates; *: based on log10 data; n: number of patients. Tables 2a and 2b, APP I (Table 5) and II (Table 6 give the data as associated with the markers (codes A - E, strata of P-UA, U-MDA, U-MDA/P-UA, U-NIT, U-NIT/P-UA). Stratification left unchanged BMI, ASFP and C-Cr (as crude marker of glomerular filtration rate), contrasting with change of numerous other parameters. 2a. General features, ASFP and renal funcdon (Kidney), blood acid-base status (Blood), and urine components (Urine) of the TRCU patients as found associated with the strata Low (L) and High (H) of 5 markers of OM; for abbreviations and medians of markers coded A - E see footnotes of Table 1. Data are mean (SE); [ ]: number of observations. For other abbreviations and further informations see footnotes and text. 2b. Additional data (urine, plasma, urine/plasma) from the same IRCU padcnts as organized in Table 2a. Data are mean (SE). For further informations see footnotes, Table 2a and text. *: Number of patients in strata; **: Creatinine clearance; p (in bold): level of significance ≤ 0.05; d: based on logio data; shaded areas: parameters supposedly participating in IRCU pathogenesis. d: based on log10 data: *: denotes Ca/Pi in urine divided by Ca/Pi in plasma: **: denotes 103 × N-Alb-P in urine divided by N-Alb-P in plasma; dashed position (UM/PM): end-point of Ca and Pi metabolism, as modified by change of parameters given as shaded positions (codes E, D, B). Code A: The stratum H patients of P-UA exhibited decrease (p ≤ 0.05 vs. L) of U-volume, U-PFI, U-SS-HAP, U-N-Alb-P, U-Ca, U-xanthine, U-citratc (Cit), U-magnesium (Mg), FE-UA, FE-Cit; there was increase (p < 0.05 vs. L) of U-SS-UA, plasma (P) concentration of N-Alb-P.
Code B: The stratum H patients exhibited increase of age, diastolic (D-) and systolic BP, B-HCO3- and B-pH I, U-volume, sum of U-sodium (Na) and U-potassium (K), (Ca/Pi)/Cit, (Ca/Pi)/Mg - both ratios discussed as inhibitors respectively promoters of the transformation of poorly crystallized CaPi to Ca-rich HAP crystals  - U-UA, U-Cit, U-Na, U-K, U-Mg, P-Mg, FE-UA, FE-Ox, FE-K; there was decrease of SS-UA, SS-CaOx (but not SS-HAP), P-PTH and P-AVP. Code C: The stratum H patients often exhibited changes similar to those mentioned above for the stratum H of U-MDA alone (code B); however, dissimilar were the borderline only increase of systolic BP, significant increase of U-N-Alb-P, U-Ca, U-Pi, U-XA, FE-Na, FE-Mg.
Code D: The stratum H patients exhibited increase of U-volume, urine excretion of summed alkali metals, U-(Ca/Pi)/U-Cit, P-Pi concentration and P-Osmolarity, U-K and U-Mg; there was decrease of U-SSUA, U-SS-CaOx, U-SS-HAP, U-Ox, P-PTH and PCa/P-Pi ratio. Code E: The stratum H vs. L patients also exhibited changes similar to those observed for stratum 11 of LINIT alone (code D), with a few important exceptions: increase of U-N-Alb-P, U-Pi, U-XA, P-Pi, P-Ox, but decrease of U-Ca/Pi and this ratio divided by Ca/Pi in plasma (in Table 2b and the following text denoted UM/PM); there was borderline decrease of U-SS-HAP and P-PTH. On the basis of above changes the shaded positions in Tables 2a and 2b, APP I (Table 5) and II (Table 6) are conceived as hypothetical frontier ("red line") in IRCU pathogenesis. A series of parameters was selected from Figure 1 (UpH, B-HCO3 -, U-N-Alb-P, FE-UA, but omitting- urinary total protein concentration), Table 2a (P-UA, U-volume, D-BP, UM/PM, 1 0 3 × U - N - Alb - P P - N - ALb - P (in the following text denoted as UNp/PNp), APP I (Table 5) (U-Na); stratification of these parameters according to medians allowed to identify those parameters that predispose for a shift of SF to SB patients (Table 3). Accordingly, only U-pH and D-BP (positive), and B-HCO,- (negative) impacted significantly upon SB frequency, whereas the impact of P-UA and P-N-Alb-P, U-volume and U-N-Alb-P was borderline (by Fisher's exact test); other parameters, including the rest of OM biomarkers, U-SSCaOx, U-SS-HAP, U-SS-UA (all not listed) did not impact at all (p-values > 0.10). +++: p-value (Fisher exact, 1-tailed test). To examine whether reports urging for change of paradigms in this disorder [8, 44–46] are justified, the focus of the section was on interdependencies of variables. From large correlation matrices (mentioned in Methods chapter; not shown) and the ranking of parameters underlying the SF and SB distribution frequency (see Table 3) several blocks of paired observations were selected and appropriate terms coined (see APP III (Table 7), columns SF and SB): "Acid-Base", "Blood pressure. Uric acid", "Protein", "Calcium". 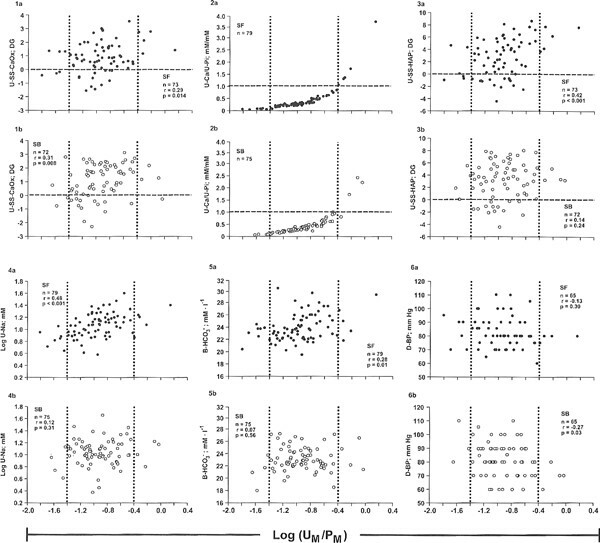 As regards block "Calcium", strong positive correlations in both SF and SB link UM/U-Cit and UM/U-Mg to Log UM/PM; PTH and l,25(OH)2D also correlated directly in SB and SF, indicating intact functional axis between these two parameters; however, in SB, not SF, PTH was significantly negatively correlated to U-NIT and U-NIT/P-UA, and in both SF and SB the insignificant correlation of PM and UM (r = 0.13 and 0.12, p = 0.24 and 0.29, for SF and SB, respectively, not shown in APP III (Table 7) suggests dysregulation of extracellular Ca and Pi homeostasis. Regarding this point, transparency was improved by relating Log UM/PM, the ratio felt to reflect imbalance of Ca and Pi in urine and/or plasma (Table 2b, code E), to numerical values of UM, U-SSCaOx, U-SS-HAP, U-Na, B-HCO3- and D-BP (Figure 2, panels la and lb to 6a and 6b): In panel 2a and 2b the vast majority of SF and SB patients clusters below the value 1.0 of UM molarity, linked to Log UM/PM via a curvilinear (log-linear; not shown) relationship; yet with respect to U-SS-CaOx (panel la, lb) most patients exhibit positive values, viz cluster within the low area of metastability, contrasting with U-SS-HAP (panel 3a, 3b); furthermore, in SB patients there is loss of significance of positive correlations (U-SS-I HAP, U-Na, B-HCO3-; panels 3b to 5b) and between Log UM/PM and D-BP an inverse significant correlation emerges (panel 6b). Notably, ASFP, U-Na, P-Osmolarity, P-AVP in both subsets of patients failed to correlate significantly with any of the variables listed in APP III (Table 7. Synopsis of variables linking L M /P M (synonymous Ca/Pi in urine divided by Ca/Pi in plasma) to urine U-SS-CaOx, UCa/U-Pi, U-SS-HAP, U-Na, B-HC0 3 ", D-BP in SF (•) and SB (o) patients, respectively, in the same order, except U-Ca/U-Pi, the partial regression coefficients in MRA (beta, followed by p-value) were: SF 0.33, 0.003; 0.21, 0.06; 0.51, < 0.001; 0.11, 0.27; 0.04, 0.71; SB 0.35, 0.009; 0.10, 0.43; 0.22, 0.09; -0.04, 0.75'; 0.24, 0.05 (see Table 4, block "Calcium", for outcome U M /P M and influential variables 1, 3, 4, 5, 6). Stippled vertical lines: span the range of Log (UM/PM)within which the vast majority of patients clusters (see panel 2a, 2b). Dashed horizontal lines: In panel 2a, 2b these indicate that at molarity of urine Ca/Pi ≤ 1.0 the majority of padents is exposed to ab initio present nanosized amorphous and poorly crystallized CaPi ; note also that most SF and SB patients exhibit SSCaOx values in the low range of supersaturation, by definition meaning that preformed HAP-containing stone nidus (interstitial plaques) upon their protruding into mbular lumen preferably can be overgrown by amorphous CaPi, then CaOx, and only thereafter by HAP (see panels 2a, 2b vs. la, lb and 3a, 3b) explaining why CaOx dominates as stone mineral [6, 84]. According to MRAs, including significant (p ≤ 0.05) correlations from each of the four blocks in APP III (Table 7) (for exceptions see column Remarks) and Figure 2 (panels 2a, 2b omitted from MRA), the degree of outcome prediction differed dramatically, depending on whether SB and SF subsets are considered, or unclassified (SF + SB) IRCU (see Table 4): In SB, the combined impact of P-PTH, U-NIT and BMI upon PlM (synonymous PCa/P-Pi) was borderline only significant, whereas in SF the same variables predicted PM highly significantly; also in SB, but not SF, D-BP and P-UA were significantly modulated by several OM biomarkers and BMI, respectively; in sharp contrast, in SF, but not SB, the outcome U-pH was modulated by FE-K, B-HCO3 -, FE-Na and U-Na, the outcome B-HCO3- by U-pH and UM; finally, in both SF and SB PXP and UNP/PNP were roughly equally modulated by 5 and 2 influential variables, respectively. Collectively, in SF 92% of the variation of U-pH, B-HICO3-, PNP, UNP/PNP, PM can explain that the risk of formation of new stone(s) is suppressed, whereas in SB 69% of the variation of D-BP, P-UA, PXp and UNp/PNp can explain the risk of new stone formation (Table 4). Of importance, differences in outcome modulation as described for SF and SB subsets would go undetected when unclassified TRCU (SF + SB) is studied (Table 4). *: number of Paired observations; ** fraction of the model (= 1.0), adjusted for confounder; ***: level of signification of the model; dashed regions: degree of outcome prediction in SB deviates from SF patients. Comparing subsets of IRCU, for example patients with hypercalciucia or normocalciuria with healthy controls, has a long tradition, but failed to clarify why stones form even in the absence of risk factors such as urinary excess of calcium (in the authors' laboratory Ca in daily urine is in the range of normals in approx. two thirds of patients (unpublished data)) and/or deficit of crystallization and stone inhibitors. On the other hand, in comparative controlled studies, signs of tissue inflammation such as elevated serum C-reactivc protein (CRP) were found in overweight patients with unknown state of kidney stone formation , high CRP together with deficiency of antioxidant vitamins in IRCU as a whole (SF + SB) , elevated CRP in association with elevation of biomarkers of oxidative stress in patients with moderate kidney diseases . Inflammatory proteins also are components of renal CaOx  and other Ca crystal-containing stones , whereas in present work the moderate rise of U-NAlb-P (as putative but crude marker of proteins with inflammatory and other adverse functions) appears compadble with impact of stratum High of P-UA, U-MDA/P-UA, U-NIT/P-UA (Table 2b, codes A-E). Apparently, rather than controlled studies those aimed at comparing IRCU subsets exhibiting so far largely neglected features (for example ROS regulation of protein in terms of anatomic location, structure and function, minerals, BP) may set the stage for change of paradigms in pathogenesis of this disorder [8, 44–46], notwithstanding objections that so doing would leave unclarified those mechanisms underlying the numerous renal and systemic metabolic parameters associated with formation of first stone. It has been proposed that oxidative stress combined with nitrative stress (see below) is a prominent feature also of chronic diseases other than IRCU . In IRCU observations on pre-existence and site of origin of both kinds of stress and interactions to form stones are unknown up to now, whereas in calcificadon processes of blood vessels respective reports abound . Earlier work described ischemia and microvascular diseases as causes of renal tubule-interstitial disease , identified ischemia and anoxia as abettor of renal tissue lipid peroxidation  and in the transplanted kidney as cause of alteration of renal cortical cation composition , as pre-decessor of oxidant/antioxidant imbalance together with glomerular and intraepithelial tubular CaPi deposition and BP elevation after infrarenal vascular grafting ; finally, repair processes of blood vessel tissue ("response to vascular injury") were accused as ROS source , and expanding adipose tissue surrounding blood vasculature has been identified as key player in hypoxia induction via static narrowing of vessel diameter , subsequent endothelial dysfunction , production of ROS  and inflammation . Thus, ROS excess within kidney, together with opposite differentiation of vascular and bone cells by hydrogen peroxide  - a member of the ROS family of which the OM marker U-MDA (Table 2a, code B) is a descendant - may facilitate unforced events such as extracellular matrix vesicle calcification  via P-Ca and P-Pi dysregulation (Table 2b, code D) and mineral accumulation at appropriate ambient P-Ca/P-Pi and pH . Since SF and SB subsets are similarly ovenveight and OM biomarkers statistically indistinguishable (Table 1), it is not surprizing that plaques apparently arise in basolateral urothelial membranes, interstitial, perivascular and possibly vascular wall tissue [5, 6, 9, 45]. In IRCU as a whole a decrease of bone mineral density has been known for long [65, 66]; both, decrease of bone mineral formation and increase of bone mineral dissolution carry the risk of pouring extra Ca into blood circulation, in turn seeking dissipation via tubular fluid and urine or, in the more alkaline extra-luminal environment, deposition as CaPi in renal tissues. However, searching for more details of a ROS-mediated bone-kidney functional axis  in IRCU was beyond the scope of present work. 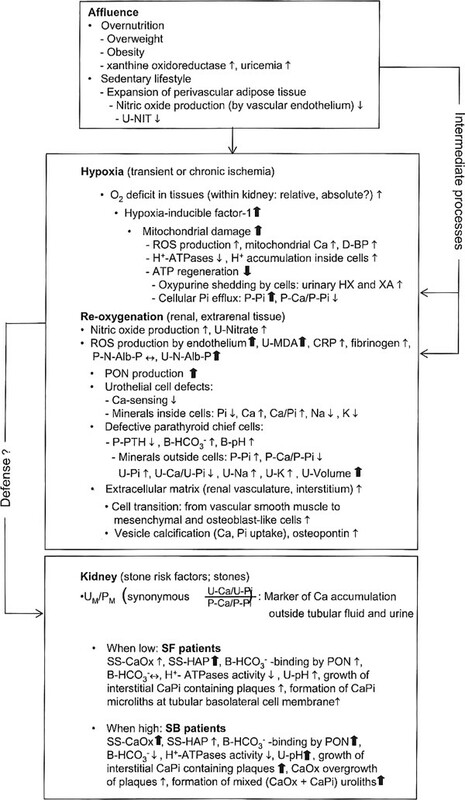 Tentative flow scheme of events in IRCU, together facilitating malregulation of mineral, acid-base, BP and protein status, renal interstitial CaPi deposition (plaques) and Ca stone formation. BP: blood pressure; B: blood; P: plasma; U: urine; ↑, ↓, ↔: increase, decrease, no change, respectively;? : Uncertain or unknown. For further abbreviations and information see text. PM - Integra/of ROS-initiated cellular defects? In Ca stones the dominant component is CaOx, although in smaller stones (< 20 mg) the core is CaPi [84J. However, whether along the nephron and at which site intratubular U-SS-CaOx dominates over USS-HAP and vice versa is an ongoing matter of controversy . The impressive curvilinear linkage of UM/PM to UM(Figure 2, panels 2a and 2b), a so far unreported phenomenon in IRCU, testifies that a rise of UM (synonymous U-Ca/U-Pi) above 1.0 is limited by growing PM; accordingly, U-Volume-independent precipitation of amorphous CaPi  should be detectable in most patients, leaving the possibility that due to U-Ca excess in a minority of patients CaPi phases such as Ca-Hydrogen-Phosphate (Brushite; crystallization starts at Ca/Pi = 1.0) can develop and promote the transformation to HAP as well as heterogeneous CaOx nucleation by HAP (and its less Ca containing precursors (for more details see ref. [85–87]). In fact, in fasting urine of IRCU males only non-crystallized CaPi ("isotropic" by petrographic microscopy) particles abound, whereas CaOx crystals are the exception . In addition, the failure of increasing SS of both Ca salts to manifest as shift from SF to SB patients (p > 0.10, see Table 3), despite high U-Volume-mediated low inhibitor concentration (APP III (Table 7), block "Calcium", positions 1, 2), argues for an alternative scenario of formation of new stone(s): it should include initial tissue damage by ROS (as shown herein), followed by deterioration of function of the axis tubular luminal membrane Ca receptors  -* parathyroid gland activity -* U-Ca/U-Pi (synonymous UM), with the consequences that in this setting decrease of PPTH (Table 2b, code B), increase of P-Pi, and decrease of P-Ca/P-Pi (Table 2b, codes D, E) emerge as central events. This interpretation would be in agreement with vascular smooth muscle cell adaption and release of calcifying vesicles in response to dysregulation of ambient Pi and Ca [63, 89], and the positive (in healthy normals negative, according to textbooks) correlation of PM with PTH, as seen in SF under conditions of high U-NIT, hence high endothelial NO production (APP III (Table 7), block "Calcium", position 6). Not surprisingly therefore, in present work U-NIT and U-MDA are directly correlated (n = 52, r = 0.49, p < 0.001, and n = 65, r = 0.25, p = 0.05, for SF and SB, respectively), suggesting that once high U-MDA (ROS excess; Table 2a, code B) meets high U-NIT (high NO production; Table 2a, code D) then peroxynitrate (PON) is formed ; this reaction product of superoxide anion (the precursor of hydrogen peroxide) with NO-derived nitrite and nitrate [33–35] is highly toxic to constituents of living cells especially of vascular endothelium , can be reconciled with downregulation of PTH in presence of high U-MDA and U-NIT (Table 2b, codes B and D) and, from reasons outlined below, with declining B-HCO3 - as strong Ca stone formation driving force (Table 3). Ca stones in situ - Endpoint of one paradox or Several? Ca salt SS as stone formation driving force (this work) proves elusive, meaning that decipherment of factors such as oxidative and nitrativc stress in signalling network ("Crosstalk between cells") ma)' be key for elucidation at the cellular and molecular level ; in this respect IRCU would resemble calcification of blood vasculature [63, 101] and other widespread human diseases [102, 103]. The present IRCU study, organized in a "bringing the bedside to the bench" manner, substantiates that, depending on the state of selected OM biomarkers, a number of Ca stone related parameters of blood, plasma and urine are paradoxically disordered: During eubicarbonatcmia (absence of overt metabolic acidosis) B-HCO3 - and D-BP rise in association with rise of the lipid-peroxidation markers U-MDA and U-MDA relative to P-UA, whereas UM, PM, UM/PM and P-PTH decrease in association with rise of the NO-derivcd markers U-NIT and U-NIT relative to P-UA. Stone neoformation appears mainly driven by interaction of oxidative (high U-MDA and U-MDA/P-UA) and nitrativc (high U-NIT and U-NIT/P-UA) stress, presumably leading to lowering of B-HCO3 - via binding to a so far neglected metabolic intermediate. Although observed data need confirmation by controlled studies, a tentative view of events (Figure 3) gives the impression that IRCU is best conceived as a defense process against affluent lifestyle-introduced consequences for renal tissues, blood and urine constituents. Further intense research into mechanisms underlying OM-modulation of acid-base status, mineral and protein homeostasis, and dynamics of blood vasculature is justified. Shaded areas: parameters supposedly participating in IRCU pathogenesis (see also APP III). Shaded areas: parameters supposedly pardcipating in IRCU pathogenesis (see also APP III). This work is dedicated to Professor Alfred Sigel, former head of Department of Urology, University of Erlangen-Nürnberg, Germany, for his long-standing interest in and strong support of renal stone research. We are grateful to numerous practicing physicians for long-year cooperation with patients, our coworkers Karin Schwilie for technical, Marie-Lulse Rasenack for secretarial assistance. Financial support was granted by the University of Erlangen Hospital Research Funds and the Deutsche Forschungsgemeinschaft Bonn/Berlin, Germany.